Don't let the competition leave you out in the dark. Make sure that your business's sign shines brightly even after the sun has gone down. Our aluminum gooseneck light fixture allows you to display your signage elegantly and proudly, ensuring that prospective customers know who you are and what you have to offer. Sign lighting is a must-have, especially in the wintertime when the sun sets early but shoppers are still out and about. In upscale and trendy areas where old-fashioned internally lit sign boxes are quickly going out of style, these elegant RLM lights ensure that your façade will be as tasteful and sophisticated as the product you provide. Each long gooseneck RLM light features a long, gracefully arched arm ending in a domed shade. The domed shade gives this fixture a chic contemporary flair while directly shining a bright pool of light onto your sign, entryway, or awning. 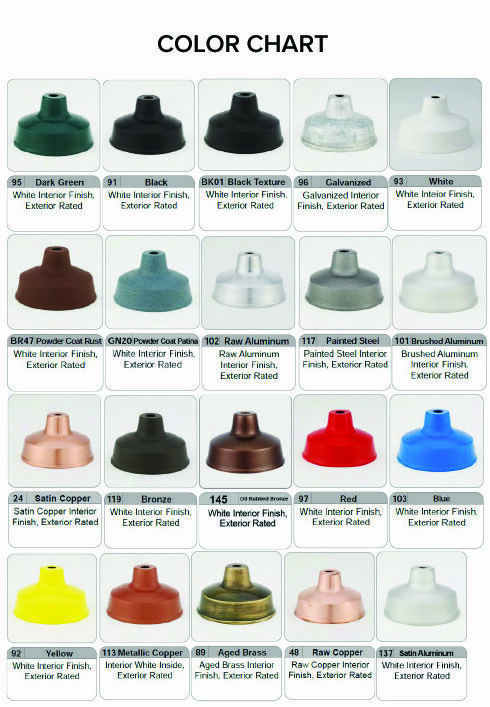 A variety of finish options ensures that you will find the perfect color match for your fixtures, without worrying about painting them to match your exterior design scheme. We offer everything from Iron Rust to vibrant Yellow in a durable powder coat finish that will keep your fixture rust free and protected from the elements. The interior of the shade will be powder coated white unless otherwise specified at checkout. Call our customer service department to discuss alternate arm configurations and custom color matching. These commercial grade aluminum gooseneck lights enhance the look of your business's façade while also providing much needed illumination. Aside from signs, they are also a great way to light doorways, walkways, garages and barns, statuary and monuments. Each gooseneck light includes a 4 5/8" diameter cast aluminum wall mounting plate designed to fit over a 4" weatherproof recessed octagonal or round J-box. Predrilled holes are 3 1/2" on center.